This is a gentle yoga class for women during pregnancy to stay active, destress, reduce pregnancy symptoms, and connect with your body and baby. 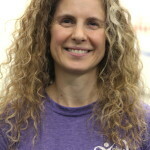 Sonya Beaudoin has been teaching yoga since 2002. She holds a B.Sc. in Exercise Science from Concordia University, and several certifications in Yoga, fitness, and Pilates. Since she became a mother she has been passionate to build yoga classes to support other mothers on their journey through pregnancy and post pregnancy. Sonya’s classes are dynamic and light hearted, as she joyfully shares the wisdom of yoga and the intelligent nature of the body.